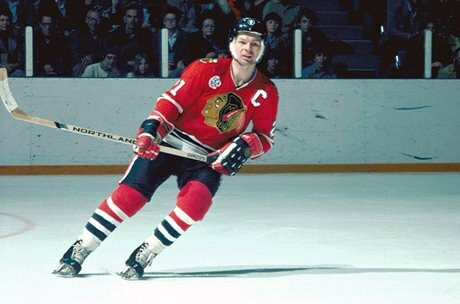 Stan Mikita is known for developing the curved hockey stick while practising with Bobby Hull in the 1960s. Born Stanislaus Gvoth, he was adopted by his aunt and uncle and moved with them to St. Catharines at the age of 8. Knowing little English, but wanting to be involved in sports, Mikita started playing hockey with a local league. He was drafted by the St. Catharines Teepees in 1956, which at the time was a junior affiliate of the Chicago Blackhawks. He played three seasons with the Teepees and was named the most valuable player by the Ontario Hockey Association in the 1958-59 season. Mikita began playing for the Chicago Blackhawks at the age of 18, alongside Bobby Hull. A top scorer in the league for many seasons, Mikita helped lead the Blackhawks to the Stanley Cup win in 1961. He retired in 1979-80 after playing 21 exceptional seasons with the Blackhawks. Learn more about Mikita on the Hockey Hall of Fame website. Read more about the evolution of the hockey stick in a Toronto Star newspaper article.